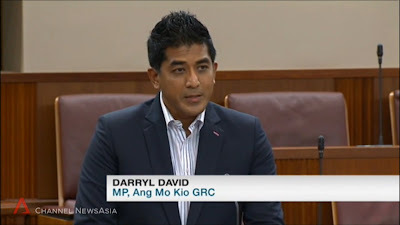 When ex-Mediacorp colleague Darryl David was first introduced as a PAP candidate last August, he talked about the importance of speaking Chinese to connect with residents. "I realised that to connect with these residents, it's important to be comfortable with the language, speaking in English and speaking in dialect. My mother is actually Teochew. So I'm comfortable with Mandarin and with Hokkien because my grandma is Hokkien." So I find it ironic that on Tuesday, in his first speech as an MP in Parliament, he talked about how important for new citizens to learn to speak English. "At a community event welcoming new citizens last year, I observed that there were quite a few new citizens who had trouble communicating because of their inability to speak basic English. "Grassroots leaders have also provided feedback: Some of the new citizens tend to not get involved in community events and activities because they feel that they aren’t able to communicate with their fellow residents of different ethnicities." He went on to propose that "we can make it mandatory for potential new citizens to attain a basic level of English-language proficiency before they're given Singaporean citizenship". So to be a PAP candidate, you must be able to speak Chinese. But to be a new citizen, you have to speak English. English proficiency should be mandatory for new citizens: Darryl David https://t.co/ceokpXkaTv "请你讲华语可以吗？我听不懂。"
Make English proficiency a must for new citizens: MP Darryl David https://t.co/l5HAvT6J3H via @sharethis. Ask him to learn Tamil first !! EARLIER: If Darryl David can be an MP, why not other TV game show hosts?